Actor and activist Ryan Gosling recently traveled with the ENOUGH Project to eastern Congo to witness first-hand the effects of war there. From the scenes he captured, Ryan created a video for the ENOUGH Project’s “Raise Hope for Congo” campaign working to create a permanent solution to Congo’s war. He also wrote a op-ed with ENOUGH Project’s co-founder John Prendergast, which has been posted at the Huffington Post website. “We recently traveled together to Congo, where the deadliest war in the world is occurring,” they write. "It’s a war which most people know nothing about, despite the fact that we’re all directly connected to it. Armed groups are fighting over the lucrative minerals that power our cell phones and laptops, leaving a trail of human destruction that has no equal globally since World War II. 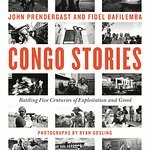 “We spent most of our time in Congo talking with survivors of this silent war. We wanted to know what they experienced, and what messages they might have for those of us who have come to rely on cell phones and laptops that inadvertently connect us to Congo. “The truth of what we heard from survivors is rooted in simple economics. Profits made from this illicit minerals trade arise from market demand for such minerals. If consumers demand conflict-free products, then companies will eventually meet that demand, in turn cratering the market for minerals mined through violence. “Luckily, instead of just feeling guilty or even boycotting consumer electronics, there are things you can do, positive steps that will have an impact on this deadly trade in conflict minerals. First, you can join the growing movement of people across the U.S. and beyond who are raising hope for Congo by directly contacting the 21 biggest electronics companies and demanding conflict-free products at http://www.raisehopeforcongo.org/rankings. The Enough Project ranked the top companies on the actions they have taken on conflict minerals to date and found that two-thirds of them have done little to nothing. Many of them assert their conflict-free intentions, but with a few exceptions their actions haven’t equaled their rhetoric. The bottom line here is this: if you demand conflict-free products, they will supply them, just like with the blood diamonds campaign that ended that deadly trade and helped stop three wars in West Africa. “Second, if you are connected to a college or high school, you can join the national drive for conflict-free campuses, in which students are leading efforts to convince school administrators to demand conflict-free products as well.